As a supplier we are keen to serve our customers as a loyal and reliable partner. Premier quality trees, from a comprehensive range, which at all times features the latest varieties, also enable our fruit farmers to continue to grow and thrive in a way that is innovative. The Carolus Trees fruit tree nursery has set itself a clear goal: to grow the best fruit trees that provide fruit growers with maximum yields. We are successful in accomplishing this aim by constantly seeking out and introducing new ways of perfecting our products: thanks to the long-standing know-how of our passionate team, our fruit growers get to reap the juicy fruits of our input. Carolus Trees understands fruit trees inside out, from root to fruit. In recent years, we have even managed to grow trees that have 10 fully-fledged branches, which has seen us exceed the highest standard (AA7+). What enables us to deliver this kind of superlative quality? “Trees are living breathing things.” Which is why our seasoned team makes every effort to keep the fruit trees intact. All the more so as the tiniest mistake during production or transport could irreversibly harm the fruit tree. We grow your fruit trees strictly in nutrient-rich soil, making sure they are able to grow and develop under the best conditions. We also provide plant, pruning, cultivation and watering advice after purchase. By constantly innovating and improving our trees, we are able to guarantee the quality of our fruit trees. So what does ‘innovation’ mean at Carolus Trees in practical terms? 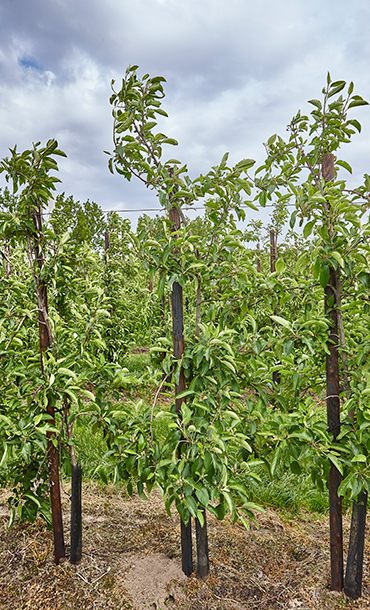 Carolus Trees is constantly seeking to develop new apple and pear varieties. In-house cultivation is an important cornerstone in this respect. In doing so, we are keeping a close eye on the latest trends in fruit farming. We are forever looking for the best ways to treat and transport fruit trees. For instance, we tie trees together using flexible nets. Plus our fruit trees never spend an entire weekend in storage inside the truck. Carolus Trees’ staff take constant in-service training to hone their skills and know-how on an ongoing basis. We not only keep a keen eye on the latest trends in fruit farming, but in arable farming too. Carolus Trees’ entire machine pool is SatNav-controlled, which has seen us take our first steps towards precision farming. Since the early 1990s, Carolus Trees has been building an extensive international network of fruit growers and cooperatives. We are investing heavily in collaborative associations with agents abroad who go out to propagate the values and vision of our fruit tree nursery as properly informed ambassadors. This is not without importance, as 85% of our production output is destined for the export markets.